Slice of Life: Are We Brave Enough? It's Tuesday! Today is the Slice of Life Challenge. I'm so grateful to the writers in this community for their continued support, inspiration, and friendship. You can stop by Two Writing Teachers to join the conversation and discover links to the stories shared. This morning my car temperature said -11 degrees as I headed off to school at 7:00. I wanted to get there early as it was my first day for writing club. This year, for the Slice of Life Challenge, I have started a writing club after school that will help us support one another even through the hard times. Students grades one through five have signed up for this challenge. I am beyond excited. But now it is 11:33 at night and I am just getting home from a crazy busy day. So know that we are in. We are brave enough to work to write every day in March. I hope you are joining us on this writing journey. It's Poetry Friday! Stop by TeacherDance where Linda Baie hosts today's parade of wondrous words. I must admit to a love of #micropoetry. There's something about words so perfectly chosen. Something about powerful meaning created from so few words. I try not to spend too much time on Twitter posting these fun little pieces as it's not really my purpose with this account. Recently, however, a team effort by my daughter and then my friend, Mandy Robek, put me on Instagram. I must admit I was thrilled to find a large #micropoetry movement on Instagram. I wasn't sure what I would do with an Instagram account, but a new phone lens, Phonto (an app), and this new community may have answered that question. 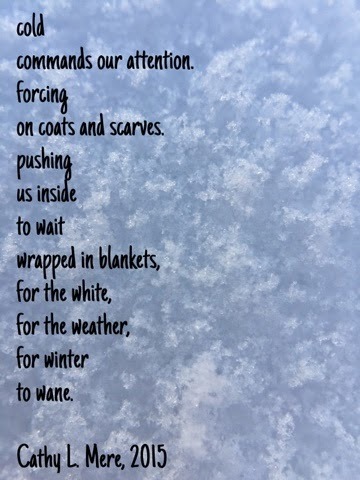 Here's today's little winter poem. We've been out of school the last two days because of the negative temperatures in our area. I think everyone is about over winter. Winter commands that we pay attention. It's not like spring that waits quietly for us to notice. I'm honored to be hosting Poetry Friday today. What better weekend for poetry than the weekend of love? If you love poetry, you'll want to come back throughout the day to see new updates. If you're joining today with a poem or other poetry treasures, leave your link in the comments. Across the day I will move them up into this post. Elizabeth Barrett Browing: Iphigene, at Gathering Books, shares Elizabeth Barrett Browning's, Sonnets from the Portuguese. Todd Boss: Friday the 13th and Valentine's Day in the same weekend? At the Drift Record, Julie Larios shares Boss's, A Waltz for the Lovelorn. e.e. cummings: Mary Lee shares Love is a Place over at A Year of Reading. More e.e. cummings: Heidi shares [i carry your heart with me (i carry it in)] at My Juicy Little Universe. Neal Levin: Michelle Barnes shares Neal Levin's limerick: Dinner with the Cannibals at Today's Little Ditty. You're sure to chuckle over this one. Eleanor Farjeon: Becky Shillington shares a poem by her favorite poet for all of the book lovers out there (and I know you're out there!). Stop by Tapestry of Words to enjoy: Books (another alternative to candy and flowers). Andrea Davis Pinkney: At Live Your Poem, Irene Latham shares three poems from Pinkney's, The Red Pencil. Nikki Giovanni: Over at Kurious Kitty, Diane Mayr shares Giovanni's: You Are There. David Whyte: Doraine Bennett shares Whyte's, The Lightest Touch, over at Dori Reads. Valerie Worth: Katie, at the Logonauts, shares Spider from Valerie Worth's collection illustrated by Steve Jenkins in Animal Poems. Leonora Speyer: Karen Edmisten shares Speyer's, A Gift, as she dreams of spring. Calef Brown: Tricia shares Brown's Birthday Lights as she celebrates her son's birthday (her brother's too) at The Miss Rumphius Effect. James Schuyler: At A Teaching Life, Tara Smith discusses February light and shares Schuyler's poem: February. Barbara Newhall Follett: Stop by to read A Night at the Orchestra shared at Bildungsroman. In A Valentine of Sorts, Catherine Flynn shares an original poem in memory of her mother-in-law who would have been 77 over at Reading to the Core. Tabatha Yeatts, at The Opposite of Indifference, shares An OCD Love Poem. This performance poem video is quite powerful. You won't want to miss it. Over at Random Noodling, Diane Mayr shares a few haiga in memory of her cat, Smudgie: Remembering. Missing spring? Tired of snow? Stop by Laura Purdie Salis's blog for a little bit of spring hope. Laura shares her Why-ku poems, Why Can't I Fly?, from her new 30 Painless Classroom Poems book, Why-ku: Poems of Wonder about the World. Speaking of birds...you'll want to stop by Author Amok where a collection of poetry about mockingbirds, owls, and other feathered friends is growing during the 2015 Sound Poetry Project. You can still join the fun! You'll smile over these original poems of penguin love shared by Margaret Simon at Reflections on the Teche where you'll find a little poetry and a bit of writing magic. Sitting near my glass doors, I glance out to see the sun is shining, but the snow still covers the ground. I've always wondered how different it must seem to live in a place where winter means something different. Stop by Book Seed Studio where Jan shares her original poem, Make Way for Winter Walking. I think I want to spend my winter in her part of the world! At Poetry for Kids, Joy shares a walk through her world and a poem written in triplets titled Rocks III. I don't think Donna Smith thinks of the cold as her Valentine. Living in Maine, she's been busy digging out from snow after snow. Stop by Mainly Write where she shares the latest weather update and a heartfelt original poem, Cold Meet Cold. Ruth wonders how, as a classroom teacher, she can ever compete for student attention with Valentine's Day on everyone's mind in her original Valentine Poem. Dear Valentine, kindness abounds at your next stop. Poems, links, and a giveaway are all featured in your stop at The Poem Farm where Amy LV shares her original poem: Hearts. Jone MacCulloch shares candy heart poetry created by students at Check It Out. Oh, this one made me laugh. On this Valentine's weekend a little reminder to husbands from Keri with this Ogden Nash poem: A Word to Husbands. Science, you won't want to miss Renee LaTulippe's party as she shares a resource rich post about The Poetry Friday Anthology for Science at No Water River. It's a Poet-a-Palooza with videos featuring Linda Sue Park, Bobbi Katz, Buffy Silverman, Mary Lee Hahn, April Halprin Wayland, Kristy dempsey and Suz Blackaby. Poetry for Your Classroom, the celebration of the Poetry Friday Anthology for Science continues at Silvia Vardell's blog: Poetry for Children. 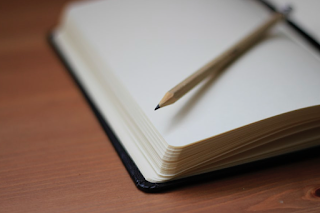 Writing, stop by Matt Forrest's blog, Radio, Rhythm, and Rhyme, where he shares some thinking about prompted writing and writing for others. I know he has me rethinking some of my own writing practices and attitudes. Additionally, Matt shares a collection of links to poetry he's written as he's traveled from one digital space to another. Games and a little haiku, you'll want to stop by Carol's Corner where she shares her new find. Haiku-You is a game of aspiring poets of all ages. Wondrous words, stop by Life on the Deckle Edge where Robyn Hood Black introduces us to the young poet, Olivia Graner. Olivia shares her love of haiku and her beautiful way with words. 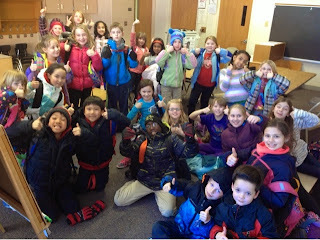 Memories, stop by Linda Baie's blog, TeacherDance, where she shares a Valentine from long ago. Downtown Abbey, you'll want to stop by Jama's Alphabet Soup for a Valentine celebration Downtown Abbey style. Pairings, you'll love Carol Varsalona's pairing of winter poetry with an original poem titled, Winter's Perfection, and an poem by William Carlos Williams titled, Blizzard. Stop by Beyond Literacy to enjoy this perfect pair. Books of long ago, stop by A Wrung Sponge where Andromeda Jazmon Sibley shares a treasure she found: A Small Child's Book of Verse. She shares a peek inside at the poems Outdoor Valentine by Eleanor Hammond and Song by William Shakespeare. March Madness, you will want to bounce over to Think, Kid, Think! where last calls are being made for poets to participate in this year's March Madness Poetry Challenge. Quiet, stop by On Point where Lorie Ann Glover shares her original haiku: Apparent Quiet. Trucks, at readertotz Lorie Ann Glover pulls a few lines from Sally Sutton's picture book: Construction. Celebrations, join Kelly Fineman for the launch of The Universe Comes Knocking. Congratulations, Kelly. Stop by Writing and Ruminating to find out more. Shakespeare, you have to stop by Kortney Garrison's blog, One Deep Drawer, where she shares Shakespearean Sonnet by R.S. Gwynn. How many plays can you recognize? Poet Visits, you'll love hearing about a recent school visit with Amy Ludwig VanDerwater. Mrs. Doele shares the magic created when Amy visited Wealthy Elementary.